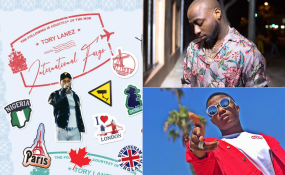 Tory Lanez surprises fans with his latest mixtape, International Fargo which includes remixes to Davido and Wizkid's songs. Tory Lanez comes through with a cover of no one else other than the two biggest Nigerian music hit exports Wizkid and Davido. The American musician, Tory Lanez who dropped his mixtape International Fargo a few hours ago has Wizkid’s “Soco” and Davido’s “Fall “in the mix. In the song, you hear him use some of the Yoruba indigenous language and this is only fair. Wizkid’s Soco was one of the biggest hits around the globe generating over and establishing his presence in the International music scene after his One Dance collaboration with Drake. Soco became the most viewed Nigerian video ever in 2018 after it replaced Davido’s Assurance with 28,832,353 views. Davido’s 2017 hit “Fall”, the biggest song in the US in 2018 became the first African song to have over 100million views on Youtube. Besides this, the song which went platinum peaked at 29 on the Billboards R&B/Hip-Hop Airplay charts for four consecutive weeks.